2018 has brought us two new Georgist books, one being a repackaging and update of the traditional Henry George School courses, and the other a guide to implementing Georgist ideas to benefit people in today’s world. 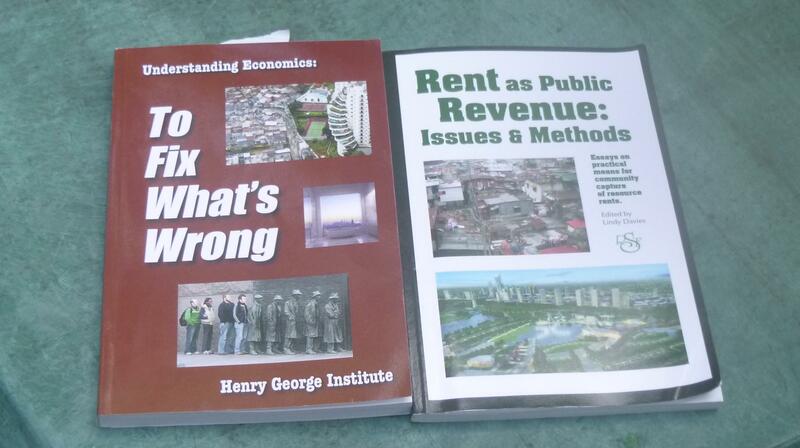 Understanding Economics: To Fix What’s Wrong (published by the Henry George Institute) is the newest evolution of the material traditionally taught in the School’s Progress & Poverty course, with some concepts of current interest taken from other courses. Most of the content is adapted from existing course materials, also with extended selections (some abridged) from the Progress & Poverty text. Those of us who took the courses years ago will appreciate the updates, particularly discussing actual experience with land value taxation and the expected effects of its widespread adoption. To Fix What’s Wrong is a great way to learn the causes of poverty, George’s proposed remedy, its feasibility and likely effects. It’s not the same as having an actual instructor and fellow students, but for many folks it’s the most practical way to learn. …assist Georgists in demonstrating how the theory can be put into real world implementation and also show non-Georgists how practical [George’s] theory is…[as well as to show] the relevance of George’s ideas to broader applications…such as air rights, franchises, easements, and the electromagnetic spectrum. The main body of the book opens with Lindy Davies’ presentation of the “Loads of Challenges” facing implementation of the remedy. In the next chapter, Ted Gwartney disposes of one of these, practical methods of appraising the land values in the real world. Other Georgist luminaries address the land value impacts of transit improvements (David Wetzel), municipal experience with land value taxation (Josh Vincent), community land trusts (Gary Flomenhoft), taxation of forests (Mason Gaffney), Alaska Permanent Fund and the potential worldwide sharing of resource rents (Alanna Hartzok), problems with treatment of land income under current laws (Gaffney again), climate change and its relationship to economic justice (Davies again). An appendix presents the original Committee on Land Taxation manual, which includes a number of Chicago-focused examples. Although much of the material in both these books is freely accessible on the internet, the full text of neither book is posted as such. Both are offered for sale by the Henry George Institute, and Rent as Public Revenue can also be purchased from the Robert Schalkenbach Foundation. "Man is the only animal whose desires increase as they are fed; the only animal that is never satisfied."